Hello Friends — I am happy to share with you my first mother-daughter (adult/child) collaborative ornament project tutorial, to highlight Aurifil’s Aurikids initiative — an effort to pass on the love and joy of needle and thread to the next generation. To dovetail with the release of Spool-en-dids collection my daughter curated for Aurifil, we will be highlighting 6 monthly projects to give you ideas on projects suitable for hand-stitching with kids. #2. YOU may also purchase collection by clicking HERE. #3. OR, ask your local Aurifil dealer to order the collection for you. Click HERE for a dealer near you! Read more about Spool-en-dids, and find out the names my daughter has for her selected colors HERE. 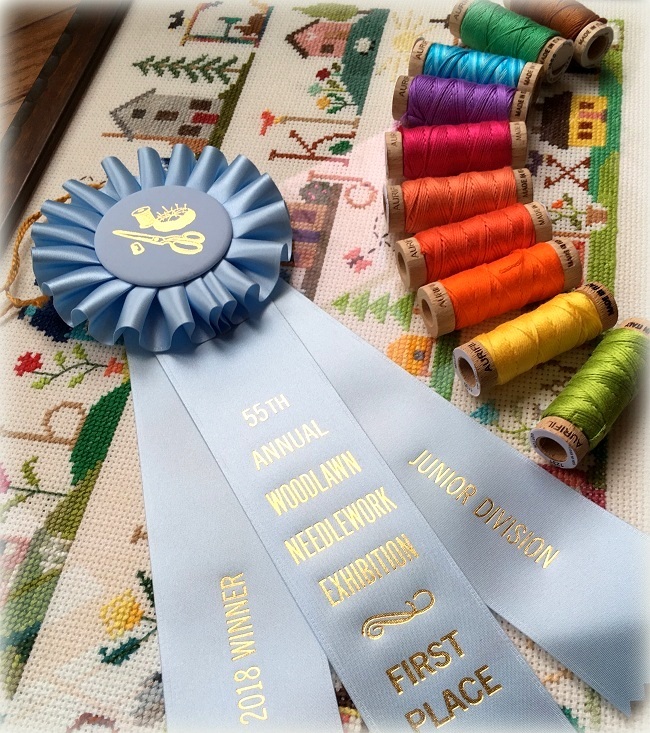 Oh, before we start, we picked up Gwen’s stitched piece at Woodlawn yesterday, with her blue ribbon! SUPPLIES: Fabric, paper-back fusible and THIN batting scraps, Spool-en-did thread (s), Aurifil 50wt thread, a piece of ribbon, embroidery hoop, tapestry or embroidery needle, & basic sewing supplies. You will need 4 pieces of fabrics – one for top, one for monogram, one for backing the stitched piecing, and one for backing the pillow case. I used a piece of silk batting because it is not as dense. I have also used the Hobbs Tuscany bleached cotton batting which worked well too. 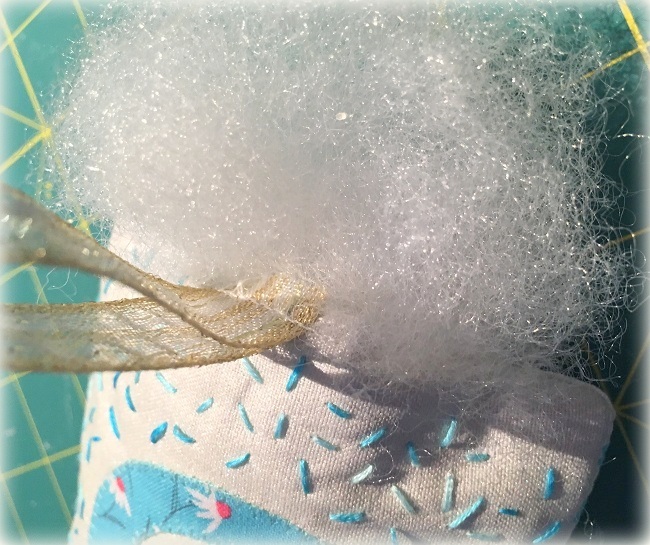 NOTE: This tutorial, as well as all subsequent pillow ornament tutorials, is not for a specific finished size. You may make it as big or as small as you wish. Since we hang our pillow ornaments on our Christmas tree, our ornaments do not finish larger than 4″. GOAL: This project is to get children familiar with the in-and-out mechanism of stitching. No rules — just random “confetti” stitching around an appliqued monogram. PLEASE read through the entire project before attempting. 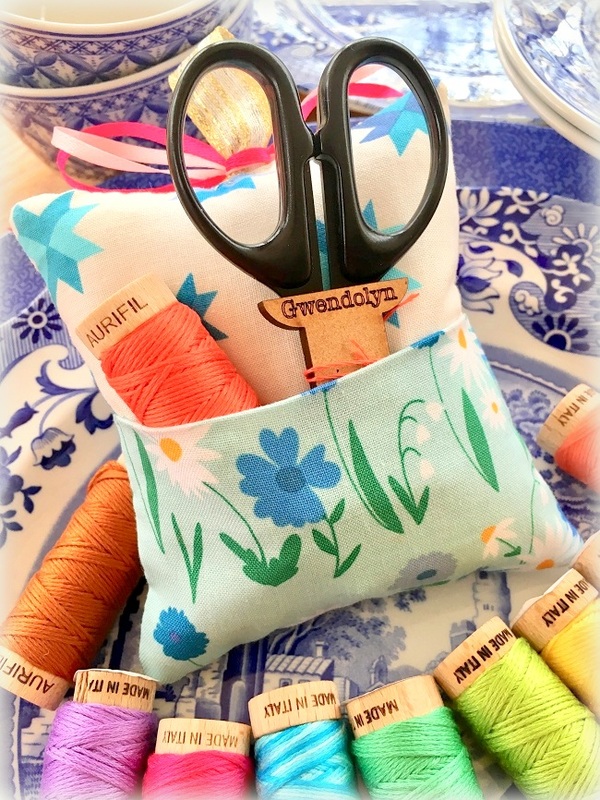 You may let your kid stitcher step in and be involved in any of the steps. For us, my daughter participated in selected the fabrics and stitching. I did the rest. 1. 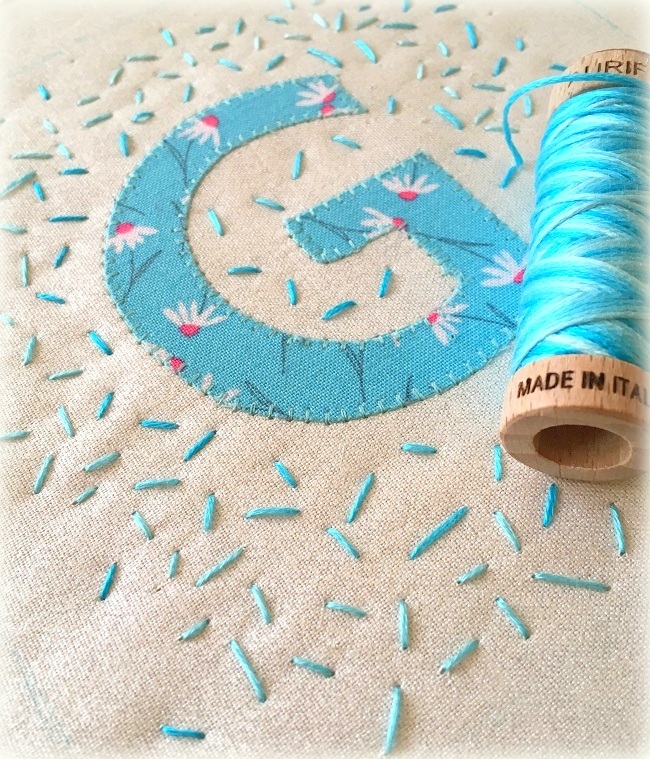 Start with an appliqued monogram on a background fabric. 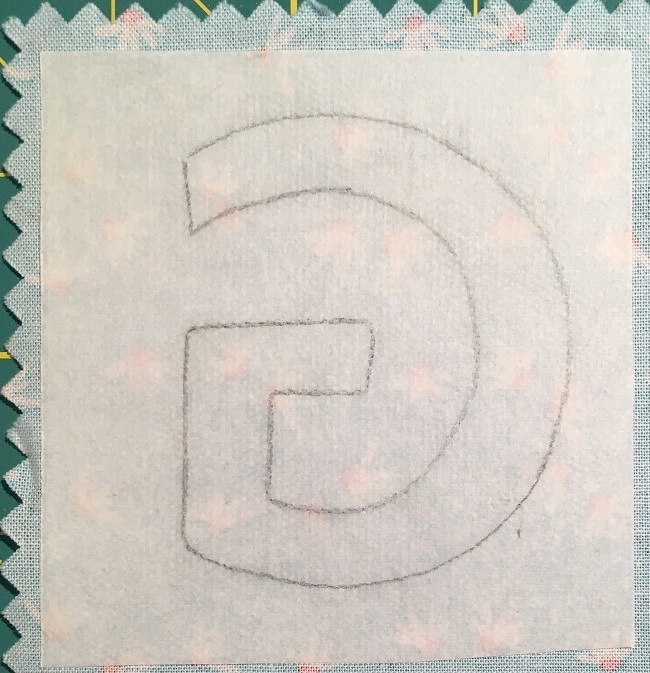 Remember to reverse your letter(s) when you trace the letter on the paper side of fusible. Click here if you would like a crash course on fusible machine applique. I always stitch around my applique shape after I fuse it in place. Stitching around the shape gives it a much finished look. 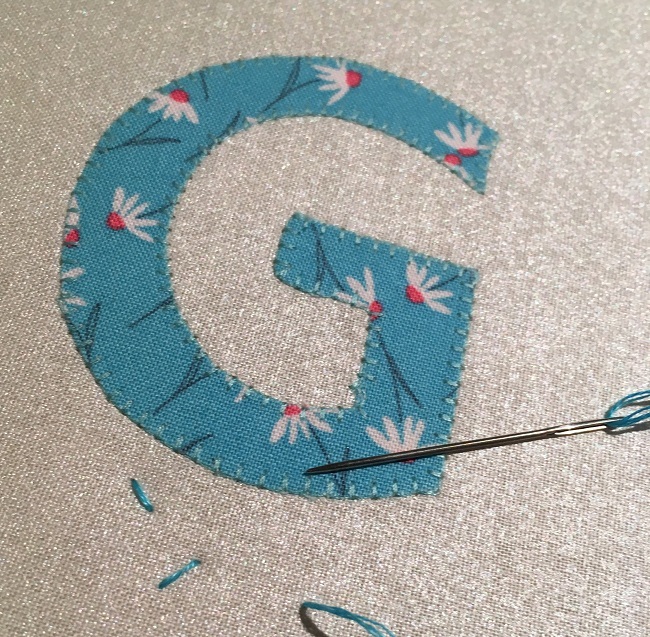 You can either do buttonhole or satin stitches around the edge of appliqued letters. 2. Then, I hooped the monogrammed piece (facing down), batting and backing piece (facing up). 3. My daughter’s work began at this point. She used a tapestry needle threaded with 3 strands of floss, and just went at it. I would recommend a large tapestry needle for younger children, and an embroidery or even darning needle for the older children for the needle to penetrate through the hooped piece. Tapestry needles are more blunt, so they are a little safter than the sharp embroidery needles. You little stitcher may use just ONE color, or as many as she wants — let her! 4. When stitching is completed, I first sewed around the area to secure the hand stitches before cutting to size for my pillow. I anchored a piece of ribbon as shown on the pillow front piece. I then cut the pillow back piece to size. NOTE: I ended up sewing a back pocket to the back of the pillow ornament for storing stitching notions. To do that, I needed 2 pieces of fabrics. One to cut to size of the pillow front piece, the other to fold in half and placed at the bottom of the pillow back piece with raw edges matching. 5. 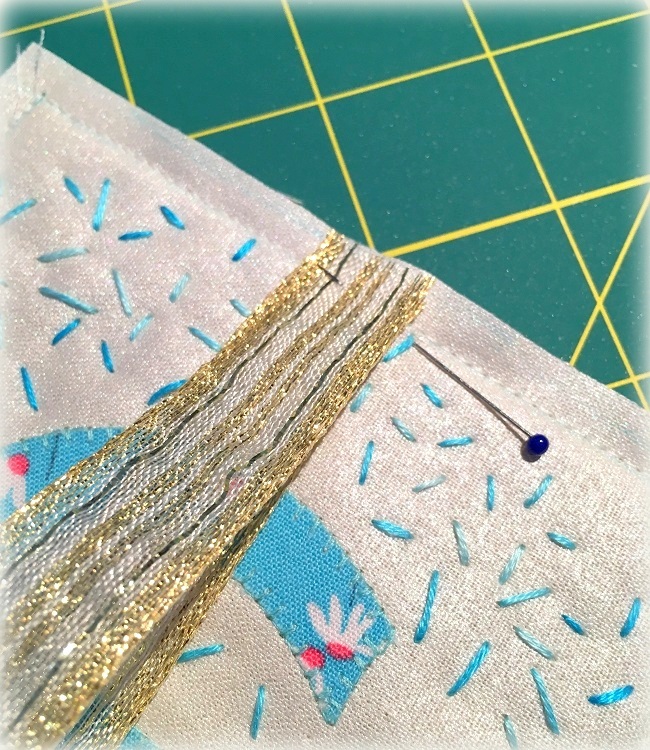 Then, with the pillow front and back pieces facing each other, I sewed with a 1/4″ seam allowance, leaving a small opening. Turn pillowcase right side out, and stuff. I started using the stuffing made by Hobbs recently, and have ABSOLUTELY loved it!! 6. Hand sew the opening shut — and you and your kid stitcher will have made a (Christmas) ornament for her! The back pocket I added to the back of the pillow ornament isn’t just for storing notions — how sweet it would be too to include a little note for a loved one if you gift this pillow ornament. #1. making different ones with different initials of your children or grandchildren to give as gifts? 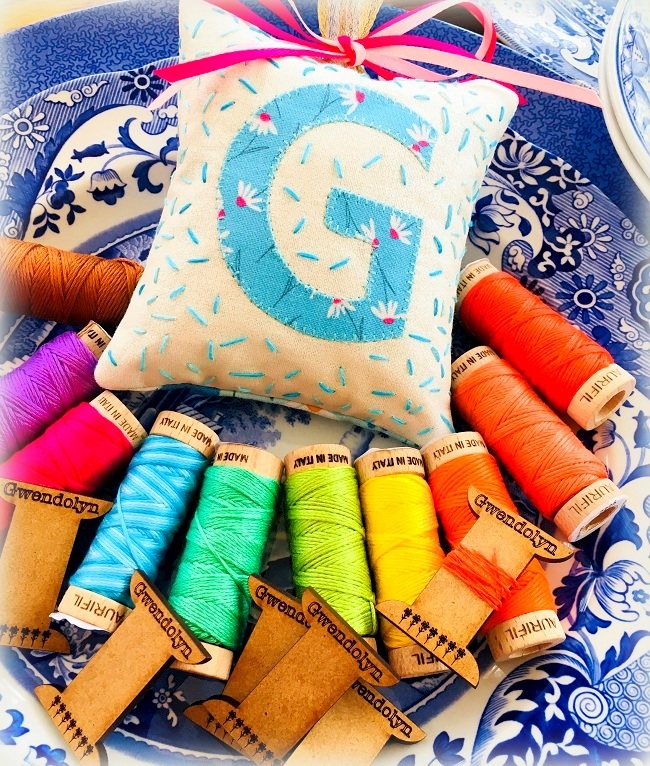 #2. making these to give for a handmade gift for your kid stitcher’s bff? #3. making a real-size pillow with the same steps for a throw pillow on a chair, to go on a bed? 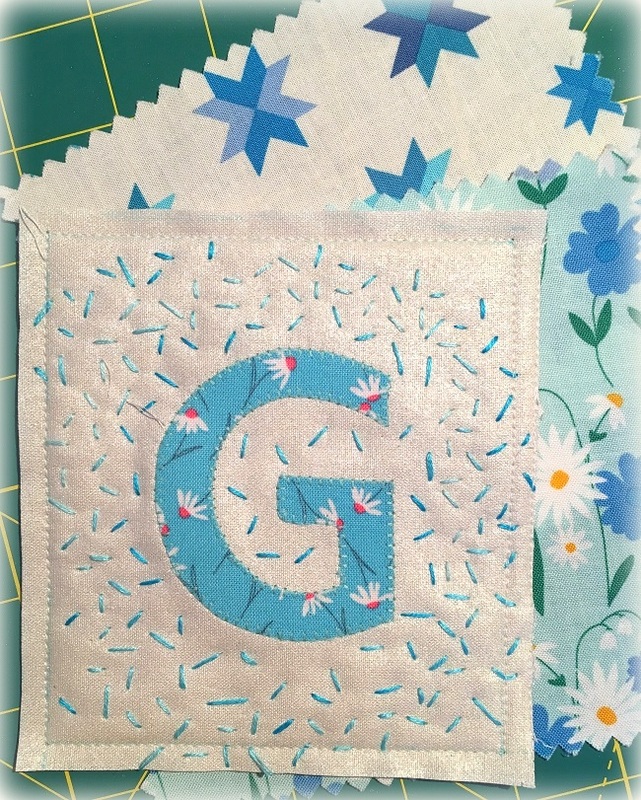 #4. instead of letters, you applique something that is near and dear to your kid stitcher, a kitty cat, a puppy, or an ice cream cone? I hope you will enjoy this little stitching project with your kid stitcher, and jump start a lifetime of sweet stitching memories. 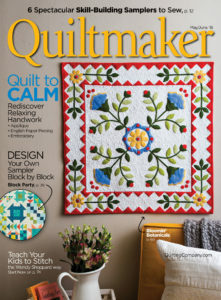 You may also read about my article on my journey with my best stitching buddy in the latest issue (May/June 2018) of Quiltmaker magazine — on newsstands now! You may also read more further about the Aurikids iniative here. Thanks so much for stopping by – till next time!